It doesn’t matter how much time you spend planning a marketing campaign, building a landing page or tweaking an ad. At the end of the day, only one thing defines whether your work is successful or not: your conversion rate. It’s natural to feel anxious about whether your conversion rate is measuring up to that of your peers. We all feel it. We usually avoid answering this because… frankly, it depends on many variables: the offer, industry and traffic source, among others. But for our latest landing page Lookbook, we found 10 brave marketers (who happen to be Unbounce customers) that were willing to share their beautiful landing page designs along with their conversion rates and other relevant info: industry, traffic sources, target audience, campaign specs. To top it all off, we’ve got some tips to offer insight into why they hit those conversion rates. Remember, these conversion rates aren’t gospel or benchmarks you should hold yourself to — but we hope these Unbounce landing page examples will offer you some inspiration… and maybe even some piece of mind that your conversion rates are on par with that of your peers. 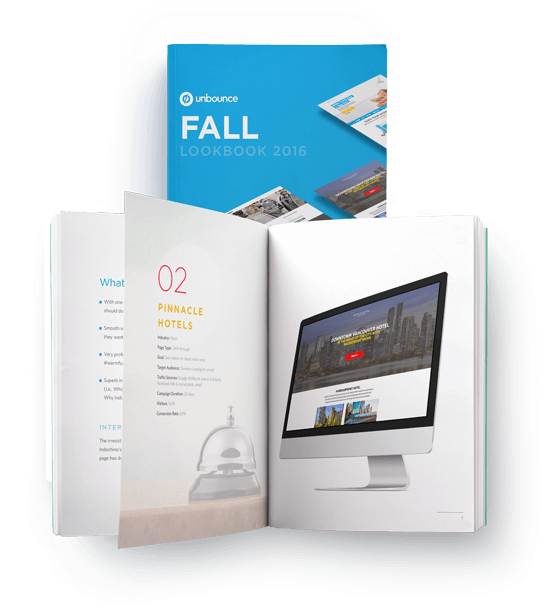 Download our Fall Lookbook for design inspiration, best practices and a sneak peek into the conversion rates of your peers.